This FREE training program is intended for attorneys barred in any state who would like to learn how to identify common forms of immigration relief. Attendees will learn about common immigration visas, defenses to deportation, and the important legal questions attorneys need to ask when screening undocumented immigrants, including unaccompanied children, for legal claims. This training will cover the eligibility criteria and how to screen for SIJS, Asylum, T Visa, U Visa, Family Petition, and VAWA. Attendees will learn about upcoming pro bono opportunities where they can use what they have learned in a supportive environment with mentoring, interpreters, interview tools, and malpractice insurance. 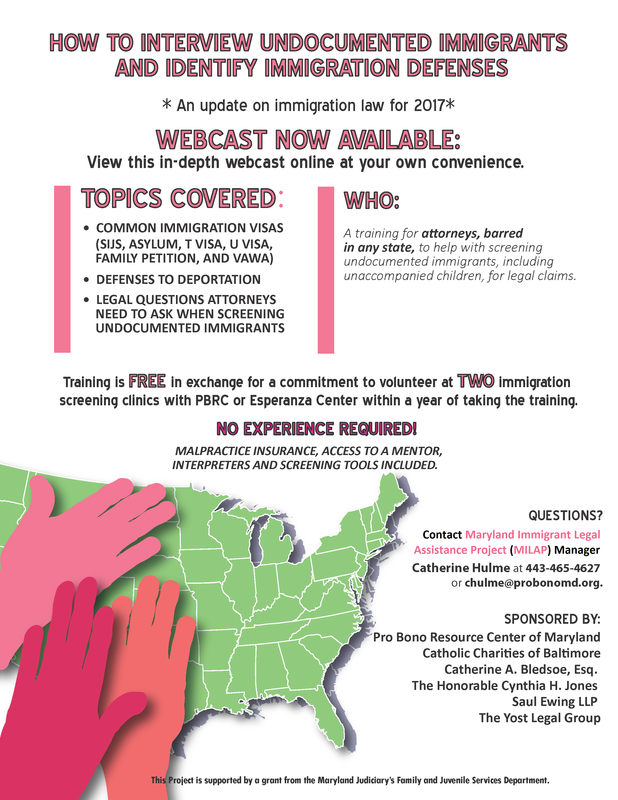 In exchange for the training, attendees must agree to volunteer at two Maryland Immigration Legal Assistance Project (MILAP) clinics during two separate dockets within 1 year of training or pay a 200 dollar reimbursement fee. It is appropriate for attorneys at all levels of experience.